Enterprise Minister Arlene Foster today announced the establishment of a new £6million research centre in Belfast. The Northern Ireland Advanced Composites & Engineering Centre (NIACE), to be located on Airport Road, Belfast is scheduled to open this autumn. The construction of the centre will be financed by the Department for Business, Innovation and Skills (BIS) through the Strategic Investment Fund, Invest Northern Ireland and Bombardier Aerospace. Invest NI’s support is part funded by the European Regional Development Fund (ERDF). Queen’s University and the University of Ulster will co-own and operate the 3,700 sq m facility. The development of the centre was inspired by the work of MATRIX, in particular from its Advanced Materials and Advanced Engineering sub-panels. Arlene Foster said: "This flagship centre will become the focal point for advanced materials as well as engineering research and development in Northern Ireland. In particular, it will enable the advancement of composites technology across a range of industrial sectors. "The state-of-the-art facility will offer firms the opportunity to develop technologies that will maintain their competitiveness and support their future business needs. Edwin Poots, Minister of the Environment, who attended the event, commented: "The tangible benefits of an efficient and effective planning system can be seen in this £6million investment project. Working in partnership with all the parties involved allowed the Planning Service to process the application for NIACE in nine weeks. This will enable the project to proceed on schedule and has highlighted what our planning system can deliver." UK Business Minister Mark Prisk said: "With the help of BIS funding, this flagship research centre will bring together leading academics and dynamic companies from different sectors and help them develop cheaper and quicker ways to manufacture composite products. The establishment of this facility will help drive economic growth in Northern Ireland and will be a valuable addition to the network of composite centres across the UK." 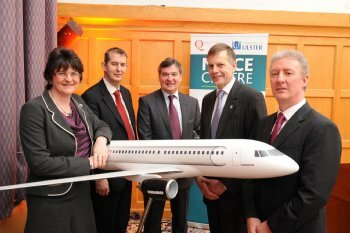 Michael Ryan, Vice President and General Manager, Bombardier Aerospace, Belfast, said: "Bombardier Aerospace Belfast is at the forefront of advanced engineering and composite technologies, having invested heavily in research and development over the years. Promoting innovation, this industry-led technology centre will not only help us to further develop our own R&D activities and those of our local aerospace supply chain, but it will enable Northern Ireland’s high value engineering and manufacturing sector to develop its capabilities, move up the value chain and compete on a global stage." Professor Peter Gregson, President and Vice-Chancellor, Queen’s University Belfast, said: "All of us here today share a commitment to Northern Ireland’s future prosperity. We are also aware of the need to develop new, and innovative, technological solutions to ensure the competitiveness of our companies, both prime contractors and supply chain organisations. As part of the network of UK Advanced Manufacturing Centres, NIACE will provide world-class support for Northern Ireland in this important area of advanced engineering." The Department for Business, Innovation and Skills’ Strategic Investment Fund offered £2.7million, Invest NI offered £1.8million, part funded by the European Regional Development Fund (ERDF) and Bombardier Aerospace offered £1.5million to jointly fund the construction of the cross-sectoral Northern Ireland Advanced Composites & Engineering Centre.